Do you have ongoing ESTIMATION activities in your math center? It's one of the ways we work on building number sense in my class. Some teachers have jars of collections or objects that children estimate and then count on a daily or weekly basis. We have an estimation jar activity that we do daily as part of our calendar activities. We use an assortment of large, multi-shaped, colored buttons. We work on estimating strategies. The children have a variety of objects to estimate at the math center. They can practice these estimating strategies with a variety of collections. 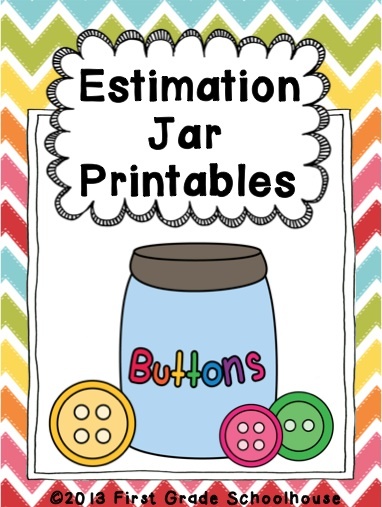 I created estimation recording printables that students use to record their estimates or guesses, along with a small poster that is posted in the math center with the counting jar.